On the Sunday before Passover, after a morale-boosting launch at the JCC of Central New Jersey in Scotch Plains, 86 teenagers geared into action to offer a helping hand to local organizations and individuals. In the spring sunshine, one group took up shovels and rakes to clear winter debris in Warinanco Park in Roselle. Another group cleaned up paths at the Humane Society in Plainfield. Still others sorted out games and books at Children’s Specialized Hospital. Some of the young volunteers stayed on the Wilf campus, where they baked cookies for the JCC’s senior program and decorated flower pots to brighten rooms for residents of a senior home in the area. 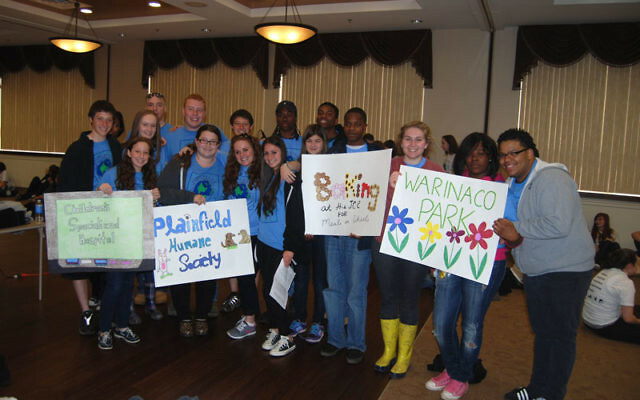 The teens were participants in the third annual Project ALIVE Day of Service, sponsored by the JCC and the “I Have a Dream” Plainfield Project. The program — the acronym stands for Alliance, Leadership, Involvement, Volunteerism, and Energy — is run in conjunction with J-Serve, the National Day of Jewish Youth Service. All in all, the teens put in 344 hours of service. Many of the students have taken part all three years. Those included a committee made up of teens — most of them now high school juniors — from the JCC and from the Plainfield IHAD, who have worked together each year planning the event. The volunteers also included students from Plainfield High, Watchung Hills Regional High, Jonathan Dayton Regional High in Springfield, Westfield High, and Scotch Plains/Fanwood High. Mid-afternoon, with their tasks done, the teens and the adult organizers gathered at the JCC for the finale. Each group came forward, bearing the poster they had created showing the organization they had helped, and briefly described what they had done. They did it in true teen style, but it was clear they found the experience satisfying — and even enjoyable. Completing the event was what has become an annual treat, a video of the day’s activities shot and rapidly edited — complete with music — by longtime JCC activist Rachel Toporek. There were cheers and teasing jeers as each group appeared, holding up their posters. Larry Johnson, director of IHAD Plainfield Project, supervised the event together with Mallory Saks, who has been the director of teen services at the JCC through all three years.